It's official, the highly-anticipated Toy Story Land at Disney's Hollywood Studios will open to guests on June 30, 2018. 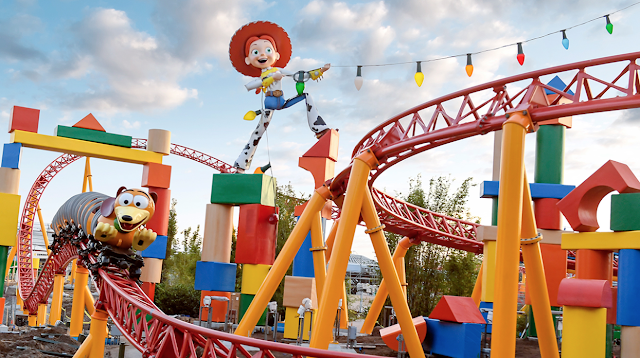 As guests enter Toy Story Land it will appear as if they have "shrunk" to the size of a toy as they explore the 10-acre expansion of Andy's backyard - featuring two family-friendly attractions, Alien Swirling Saucers, and Slinky Dog Dash. The Slinky Dog Dash ride vehicles will appear stretched as Slinky sends riders dipping and turning throughout the duration of the family coaster. The storyline for the second attraction, Alien Swirling Saucers will showcase a play set that Andy got from Pizza Planet, with the Aliens flying around in toy saucers (similar to Mater's Junkyard Jamboree attraction) trying to avoid capture of "The Claw". In addition, guests will also be able to walk through a new carnival game box queue to experience a long-time favorite attraction Toy Story Mania (which recently had a third track installed). The past several months, Disney Parks Blog has revealed videos of the family-friendly rollercoaster, Slinky Dog Dash and, noted that Toy Story Land will feature Woody's Lunchbox, a walk-up quick-service window serving tasty meals and old-fashioned soda floats. However, details surrounding the full menu and any retail shops have yet to be revealed.